JAKARTA (AFP) - The undisputed superstar in the growing world of eSports said gaming deserved its place in the Olympics -- despite a mixed reception at its debut Asian Games. Faker, real-name Lee Sang-hyeok, has gone from high school drop-out to fame and fortune through eSports, which are now knocking loudly on the door of the mainstream. He said eSports‘ growth potential and popularity among the young made them a must both for the Asian Games, where they were played as a demonstration sport in Jakarta this week, and the Olympics. “ESports has great potential to become an official sport in the Asian Games, as well as the Olympics,” the bespectacled League of Legends player told AFP. “ESports are immensely popular among the youth so I think that eSports has far bigger growth potential than any other sport,” he added. The 22-year-old millionaire is among the biggest and best paid competitors at the multi-sport Games in Indonesia, which have also hosted footballer Son Heung-min and three-time Olympic swimming champion Sun Yang. 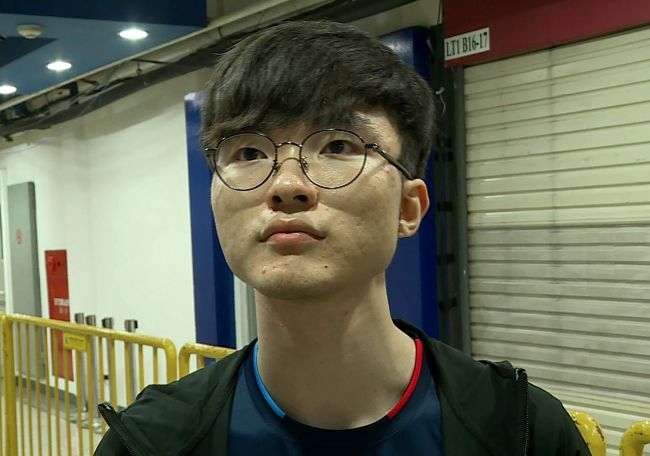 Faker, dubbed the “Michael Jordan of eSports”, enjoys similar fame and fortune to professional basketball or baseball players in gaming-obsessed South Korea. There, multiple TV channels are dedicated to broadcasting competitions, held at large football stadiums to roars from tens of thousands of fans. The sheer weight of numbers -- 25 million players, or half of South Korea’s population -- makes professional gaming “just like any other sport”, he said. But eSports don‘t enjoy such acceptance worldwide, and attempts to win a spot at the Olympics, alongside other new sports like skateboarding and surfing, have so far been rebuffed. “When will (eSports) be included in the Olympics? the simple answer is: I don’t know,” said Kenneth Fok, head of the Asian Electronic Sports Federation chief. Even eSports‘ long-trailed inclusion as a medal sport at the next Asian Games has not been confirmed, after the Olympic Council of Asia said it couldn’t give the go-ahead without an international federation for the sport -- which doesn‘t yet exist. Given the fractured nature of eSports, and the competing interests of different games manufacturers, that could prove a significant hurdle. “There is still a distance between the eSports world and the sports world -- I won’t kid, it is a far distance,” Fok said. Much of the resistance to eSports comes from the non-athletic nature of the competition, and a reluctance to encourage children to spend too much time on screens. Nowhere is the dilemma more stark than in China, home of Alisports, which is leading the charge to have eSports as a medal event at the 2022 Asian Games in Hangzhou -- the headquarters of its parent company, e-commerce giant Alibaba. But China was also the first country to brand online addiction as a disorder, and 24 million young people are estimated to be addicts -- a subject that causes great concern and has given rise to rehabilitation centres with harsh methods. When China won the first event at the Asian Games in Jakarta, in the Arena of Valor game, their coach wept as he praised the support from back home. But unlike China‘s other events at the Asian Games, state broadcaster CCTV didn’t screen eSports, continuing a long tradition of keeping gaming off the airwaves. “Most Chinese regard playing electronic games as internet addiction,” Neil Wang, the Greater China president of consultancy firm Frost and Sullivan, told AFP. “There is (a large audience), including a large amount of teenagers during the Asian Games, and CCTV needs to take that into account,” he added. Tech giant Tencent also began placing controls on its games, including the smash-hit “Honor of Kings” -- the Chinese version of “Arena of Valor” -- last year following concerns about marathon gaming by teenagers. Owing to China‘s broadcast black-out, Chinese fans missed a showstopping moment at the Asian Games: the defeat of Faker’s six-man League of Legends team by Chinese opposition.